One of our current family traditions is making Brigid crosses out of rushes. 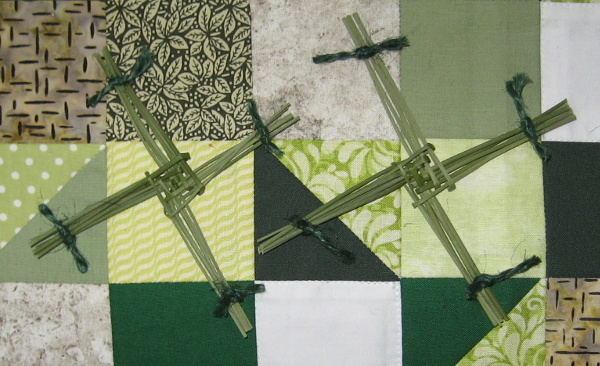 It is a fun, simple activity my daughter and I do together, and talk about who Brigid is and the festival of Imbolc itself. The crosses are the end of the process however, the first part is to gather enough rushes to make a cross each. The weather was cold, snow was forecast but missed us almost entirely, meaning it should be easy to gather a few stalks. But where? Rushes are one of those really common plants that you can never find when you need it. I had been keeping a lookout over the previous couple of weeks or so, but places I have seen rushes in the past were bare of them. Land dries out. Houses get built. Sheep and cows eat them. The drainage ditch, used previously, was not an option this year. Luckily a walk in January along a footpath new to me showed me a currently ungrazed field where there were some rushes growing, although having driven there to save short legs the boring bits and spend more time doing good or new bits, it was further from our house than I would have liked. I decided I could manage the walk, a 5-6 mile circle, if I took a snack and had a rest somewhere and put my trust in Brigid. I treated it as a walking meditation on Brigid and Imbolc. However, I did not want to pick all from one plant, and this one was so perfect, being protected from horses by the tree, it didn’t seem right to take any. A second plant grew by the fence so I gathered a few stalks, but not enough for a cross. Rushes eaten almost to ground level. I continued up to the next field, where there were a lot of rush plants in the boggy ground from which the stream flows, but all had been cropped close to the ground. Gentle but very curious cows on the footpath. And then, a herd of cows across the footpath. Why should I expect otherwise on Brigid’s day? She kept me safe, and they gently moved out of the way before closing in again behind me. There were a few bullocks, curious and coming towards me for a closer look, but they seemed quite a calm lot, as (thankfully) were the longhorns I found later – complete with bull next to the footpath. 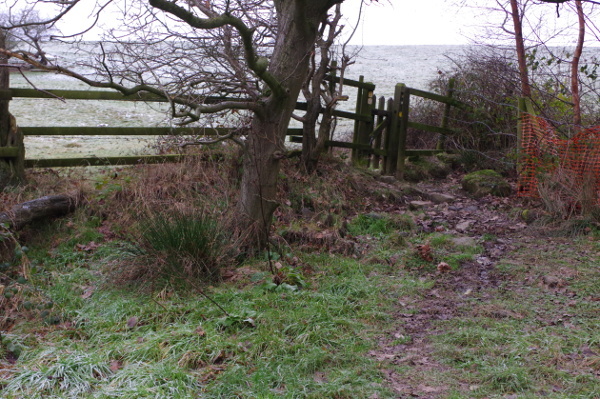 I was very glad the mud by the squeeze stile was frozen solid, however. The furthest point from home was not the rush field, but a small patch of woodland where wild daffodils and bluebells grow. It is noisy, thanks to the nearby dual carriageway, but that means if I can tune it out, a meditation is rarely disturbed. 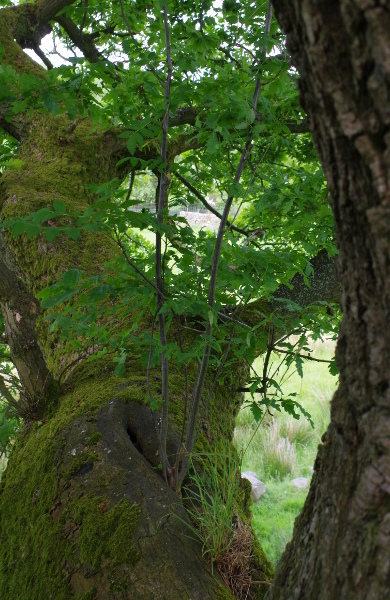 I waited to see which tree called me for a sit down – and discovered this wonderful oak. 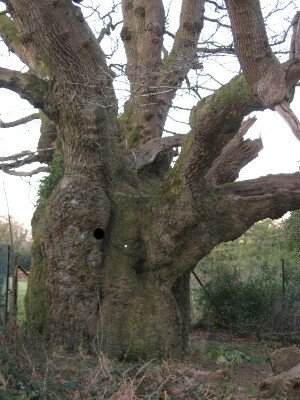 Close up of the circle oak. The hole was too difficult for me to risk climbing through without help, (I wasn’t sure if I would fit all the way, especially with the branch across the middle!) but after my rest and grounding on the frozen earth, I put my head through and felt the tree’s energies circling me. I stayed there for some minutes, exchanging energies. 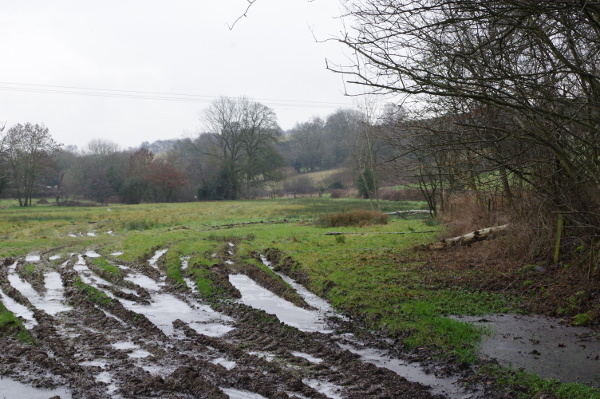 Soggy, frozen field where rushes grow. Finally I left the woodland and descending, found my field, again luckily frozen (there is a good reason why I haven’t walked this path before!) with many small rush plants growing now the cows have been moved. I picked a few stalks from several until I had enough, they would make small crosses this year but size wasn’t important. In fact, I found later they behaved very well without splitting as thicker stalks can. Frozen myself, I put all in my rucksack, gloves back on my hands, crossed the stream and began the long walk back up the hill to home. I had a celebration to prepare for. I was lucky enough to have most of a day to myself in the middle of the school holidays, which I chose to spend doing a very mini-vision quest in the form of a walking meditation. We were staying in my childhood home for a few days, so the country park that I went to was one that I knew well as a child, but had scarcely visited since. After a drop-off at the top of the hill (saving me about a mile of road walking), I started out on the most familiar track, one I cycled along almost every day for seven years of secondary school. Familiar puddles, roots, obstacles. It was raining hard, the sandy ground was as slippery as ever. As the hedges opened out onto the ‘plain’, an area of open grassland where the trees were kept back to stop highwaymen from attacking travelers on the old coaching road, I left my old cycling route and revisited the woodland areas I had explored and played in when very young. Almost unrecognisable after a gap of 30 years, yet the feelings of the place were the same. Happy, and full of potential. I then walked parallel to the plain staying within the woodland. Pleasant, even while being dripped on, though unexpectedly mostly young-ish growth with one veteran tree decaying sadly behind a fence. I came to a large oak tree I didn’t recognise, at a junction in the paths. It’s roots called me to sit down, so I spent some time there, working out exactly what my questions were. After some thought, I realised I needed to understand where I was right now and which path to take forwards. I had thought everything would change a year ago when my daughter started school, so I made all sorts of plans – and then had them systematically unraveled by being unable to do much of anything thanks to my hip injury. Eventually I got the message to stop worrying about the things I couldn’t do, and found peace within. A peace that has stayed with me, and allows me to be at one with the world. But maybe I am impatient or awkward, as it rarely feels like I am doing enough – even if that is what all the messages I receive tell me! It felt like time to ask again, as the new school year approached, and see what, if anything, had changed. Coming out of the woodland as I reached the far side of the plain, I found a familiar view from a bench where there had always been one. This was a step back into a different past – a memory of a disastrous day at school and daring to come here in my lunch break, to escape. I had failed an exam I really expected to pass, and was suddenly faced with reality being different to how I had imagined things were going. I had followed teacher’s advice, taken what I thought was the ‘easy’ route, and a subject I had always been good at, instead of following my heart. Looking back, so much might have been different that year had I stuck to my original plan. I have failed worse things since then, but I don’t think ever made quite such a wrong choice again. Having put my past in its proper place, it was time to follow a new path into my future. One that I had never walked before; small, quiet, pretty. I walked through many new areas, and eventually circled round to return via some more oaks and Scots pines. I sat in an oak, and asked what message it had for my future. The answer was not something new however, but ‘Thoroughly’. In other words, follow the advice from the ‘Certainty’ tree I had met recently, and do whatever I do thoroughly. Reach for the sky. Find the joy in it. Don’t be just liking what I do, but love it. Value it. Spend more time doing the things I love rather than simply like – and find ways to love more. Remember what I always said as a child: that it doesn’t matter why we’re here, it matters that we enjoy it. Be happy, and spread happiness. That’s all. I looked up and in front of me saw two lovely oaks, happy together. The rain had gradually eased, so I looked for a place to eat my lunch. I walked past larches and through a grove of silver birch trees. 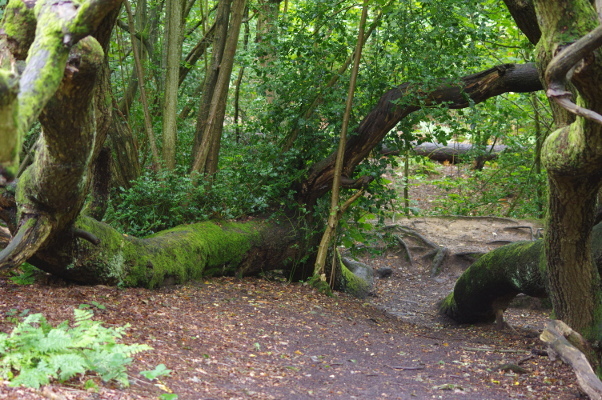 Then two oak trees lying down by a stream, covered in soft moss, inviting me to sit down. Squirrels played, some holly protected me and a hazel stood nearby. A perfect end to a perfect morning. I had another hour or so there, then walked home, picking blackberries in the sunshine. One of the things on my wish list for this year was to climb a tree – after having had a wonderful experience last year of sitting on a branch that made a natural seat. It reminded me of great tree climbs I did as a child. A pine tree in a friend’s garden with branches like a step ladder. A U-tree in a park with every branch forming a U-shape and many perfect sitting places. (Possibly a Chamaecyparis species.) An oak with a great hollow in the side of the trunk, five feet off the ground, that we would be lifted into. There is a lovely guardian oak a few fields from me that I have almost climbed a couple of times, balancing precariously on the top of the fence next to its crown, but not quite getting the courage up to take the leap into the tree itself, knowing that I would have to reverse the leap out again with no one to guide me. I have seen a few trees for my daughter to climb, but they haven’t appealed to me being either too low, or too spindly for an adult. Finally in Yorkshire last week I found an oak that actually invited me to climb it, complete with dimples for feet on the way up. 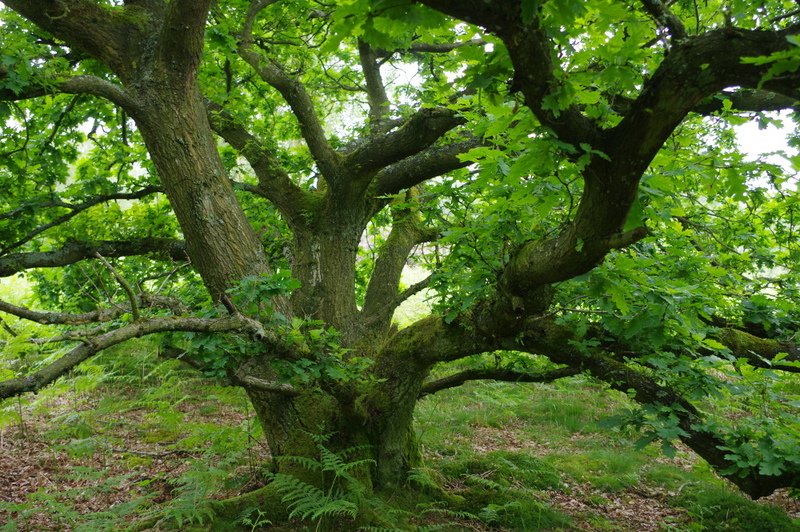 Oak is such a wonderful tree to climb, lending its solidity and presence to all endeavours which is very much apparent in the climbing and sitting, and with craggy bark to hold onto and very often soft moss to sit on. This one had a surprise for me as I peeked around the corner of the trunk – a split in a side branch had become home to a rowan tree. Rowan growing out of a crack in an oak branch. It also reminded me that sitting in a tree is quite a different experience to sitting on the ground leaning against a tree, no matter how good the connection to the tree is. This week I paid a visit to Stanton Moor (of which more next time) and wondered if I might climb the ‘climbing tree’ near the ‘cave’. 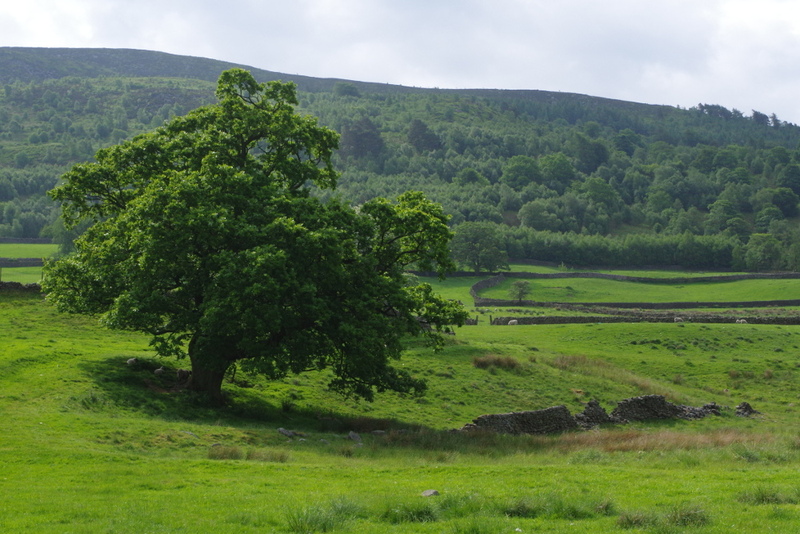 Possibly fortunately, given it is not a very large tree, I took a different route that led me nowhere near that corner of the moor. However, leaving myself open to whatever experiences should come my way, I found this beauty of an oak instead. Another tree which invited me to climb, and was fairly easy even encumbered with camera and rucksack. As I sat in the tree, I became aware of just how bizarre and atypical its shape was. Long spindly branches going off in all directions, with many small twigs growing out randomly. It covered a large area but was not particularly tall. I wondered whether another shape might be more suited to fitting in with the trees around it, that this seemed impossibly long and spindly in places. However I had the prompt answer come back at me that if it was meant to be another shape, it would have been. This is the right shape for this tree, right here, and nothing else would be as good. There was such a certainty and trust that the tree seemed completely peaceful as a result. It was then pointed out to me that I generally had certainty in my own life as well, in my path, my situation, my doings. Just trust in it. This was a good message for me right now. I see all the things in the world that bother me where harmony with the Earth has been lost, and wonder repeatedly what more I could or should be doing. I do what small things are possible right where I am to improve my area, while always wondering if they are enough. Every so often this inner conflict leads to confusion and frustration or depression in me – and I am aware that this is exactly what makes necessary change in the world. Yet regularly I am reminded that large scale campaigning or hands-on activism are not my parts to play right now, nor is it my path to live in some sort of sustainable woodland permaculture, traffic-free utopia I might dream of for the world. Like the tree says, if I am meant to be doing those things right now, then I would be. One day this might change, but just trust in myself to know. The other message I brought home from the moor, filled as it was with many different people each experiencing it in their own way and not all leaving it as they found it or making it easy for others, was to observe difference with love instead of criticism, and to keep celebrating the positive in order that the love may grow, on all sides. Maybe these things are needed just as much. I now think of this as the ‘Certainty Tree’. I will try and remember its message – and continue to climb trees. Back in February when I was redesigning and simplifying my altar, I learned that I ‘had’ an apple wand. This made very little sense to me at the time for two reasons. First, that I have never used a wand finding my finger a pretty good tool for most things, and second because I had very little connection to apple as a wood. Since then I have made some progress in understanding these two difficulties, so am now ready to write a bit more. However there were also good reasons for not using an athame as my primary tool: the intention of a blade is usually to cut, whereas my aim is usually to direct energy; elementals don’t like blades being used, iron or other materials, so if outside I would need an alternative; and finally, laws in this country make it very difficult to legally carry a knife anywhere outside the home. I couldn’t help wondering if witches did use knives for casting their circles in days gone by, whether this was for protection against being seen before the circle was complete, that the knife was then in heir hand ready for use. I also find it very hard to believe that the average witch could afford a knife that was used purely for witchcraft or circle casting; I think most were practical people who took whatever household items were most suited to their purpose and sometimes a knife was appropriate to have at hand. So having accepted a wand as my tool, I realised that the wood Apple is generally associated with Air, the fey, and music. Now I was getting a hint of why Apple might be right for me! I have recently been trying to sing the songs suggested to me by stones or water, and finding each to have its own character and be unique. Different types of stones, soil, sand, pure water or polluted water, each expressed its character through the song I sang with it, and area I have been developing and want to do more with. But was that the only reason? I decided to ask Oak about it, and have now had several discussions with him and various other allies. 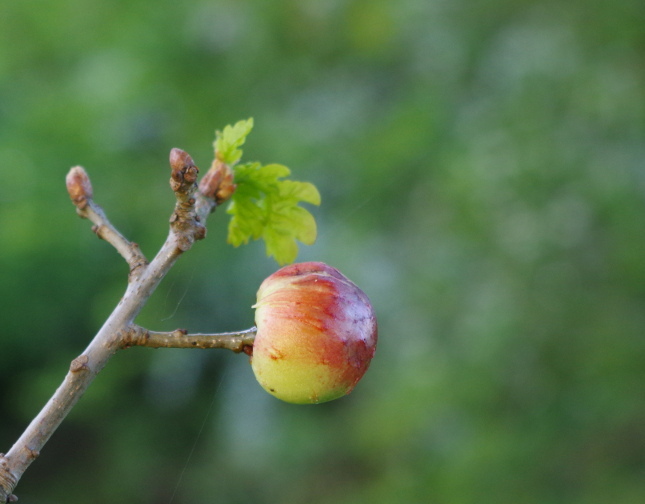 The first discussion – I already have apple trees in my garden who would like to be used, I don’t have my own oak tree! And apple will lend its gentle aid, being strong and unweilding but also add a loving, peaceful, sharing influence. The second discussion, after more reading and still feeling very little connection with Apple – yes other woods will do, but get to know apple! Apple brings calm and peace to its work, along with maturity. Not fast like Rowan, or straight like hazel, but loving and giving. Different doorways to Oak. Female. Time to set the Eve story in its proper place. I then cut a short length and whittled the corners off while fresh from the tree, and was overwhelmed by the amount of love coming from the tree. It now takes its place on my altar until I have finished making my wand. There was nothing suitable I wanted to prune from any of my apple trees, so I investigated my collection of stored wood – and found four pieces of apple from our garden already cut and seasoned from previous prunings. However, none seemed ideal for a wand being either too small once the bark was removed, or too large. Then finally, I use my wand, under the guidance of Dragon. Some weather working is needed, and I am told to use my wand to call a wind and shift the clouds that have brought persistent fog for days now. I try holding it, knowing by now how it needs to be carved, and feel its energy through my arm and hand. I direct energy with it, and feel how much more effective it is than just me. Later I go back to my pieces of wood and can feel exactly which one it is carved from. The clouds start to clear; the next day is bright sunshine. The weather forecast has apparently ‘changed’. I use my wand again a week later, first holding it too tight, then realise my mistake. This wand is very exacting! I finally understand that I am needed for weatherworking because I am not attached to any particular weather; I am actually happiest with the variety England normally gets. 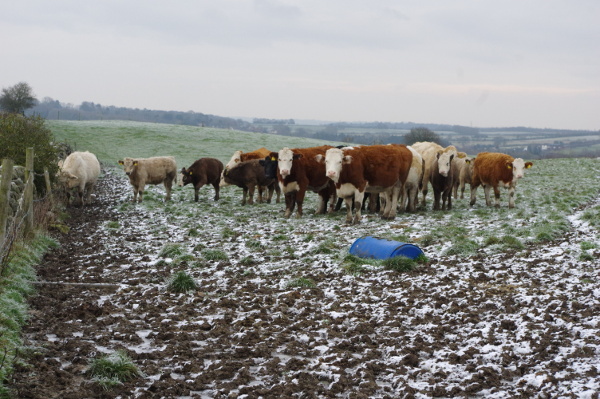 In early March I had asked if I should shift the snow, but was told it was necessary to rebalance the world and for humans to start to become aware of how they are affecting their environment, and there would be another 3 weeks of cold. There was. This time I was told it was right to shift the fog, and later to rebalance again, and therefore felt confident in doing so. Ultimately I need to keep balance, because humans are out of balance with themselves, and with the weather, wanting only sunshine. The problem is a result of humans, therefore humans must be involved in its solution, if we want to continue to work with the Earth. I have worked locally for several years, (see previous posts) but now also sometimes nationally when my awareness is capable. I share because more people around the world are needed to do this work. I didn’t choose it or ask for it, but seem to have been given the responsibility for it. I was reminded by Dragon to say again that it is not me changing the weather, I am simply doing the asking and providing the energy for it to happen. I need to be in tune with what is happening, and to always ask as I have done so far, and to find ways of directing and raising energy that suit me and are appropriate to the level needed. It can be ritual, or singing when I need more energy than is easy for me, but I also need to learn more about the various winds and which one to call up, as well as the trade winds. Apple is keen to help with this and to bring more abundance of fruits to the land. And finally, I find myself working on a writing project with the fey. I can’t help wondering if Apple has provided the link! When is a plant dead? This is a question that I have pondered more than once over the past few years, and finally have some answers. First I will explain the question. 1. Some shamans claim it is possible to talk to a tree before cutting it so that the ‘dryad’ divides in two, and lives on in the piece that has been cut off. 2. Some wandmakers claim it is possible to ‘wake’ the ‘dryad’ after creating a wand. 3. A cut branch will frequently root or graft successfully, whether or not the gardener talks to it first. Given that I am currently in the process of finding wood for and designing a wand from one of my apple trees (see Candles for Rituals, Feb 2018) these questions have a particular relevance to me right now. So having failed to find definitive answers in any of my books, I did what I usually do in such circumstances: ask the trees. The Spirit of the tree does not go to the Summerlands, Annwn, Heaven, etc as we do, as because trees do not have free will, there is no need to learn the lessons from the life just lived and plan the next life or experiences to come. Their consciousness is already merged with the All and our planet Earth continues to grow in experience and love. After our Soul Spirit has departed, our body elemental continues with our bodies until it is no longer recognisable as a body. Then the elemental passes over to other more simple elementals, while it goes on to help us form the next physical body we inhabit. The same with trees, after the Spirit of the tree withdraws. Fire elementals are generally involved in the making of compost, then compost becomes Earth, or dissolves in Water, so new elementals take over. But if a piece of wood is stored carefully, it does not decay. The way I understand it is this: if a bicycle can be conscious and talk to me, or a rock or crystal, so can a piece of wood from a tree. It doesn’t have exactly the same consciousness, it is no longer alive, but it has a consciousness all the same which is related to the tree it once was. In my desk the wood comes from more than one tree, so the consciousness becomes more complex, and possibly deeper. In a wand, there may be different elements which combine – including the consciousness of the person using the wand. I understand now why a wand has to be a very personal tool, and why they are usually broken on the death of the witch or magician who used it. I also see a parallel here with bones. Just as a specific branch can help the user connect to the original tree, so could a specific bone could help a person connect to a specific ancestor – many barrows when opened up were found to have skulls neatly arranged inside them. But after time, when the original link is lost, there may not be a connection to a specific person any more – but a human bone will still have a different consciousness than a cow bone, or a sea shell just like a malachite is different to a moss agate or an amazonite stone. One further thought was offered to me by Oak: trees are very aware of being cut and of the consciousness and intentions of the person doing the cutting. Oak gave me two examples of when this really matters. First, a branch cut specifically for propagating will take better than one pruned off and then grafted or rooted as an after-thought. Second, flowers are the peak of a tree’s energy and beauty; cutting it off in its prime is very confusing and distressing for the tree and the flower elementals. If flowers are cut for enjoyment as cut flowers, then please share your love of them with the tree and explain why you are cutting some of its flowers off (never cut all the flowers off a plant!) and leave the plant something in return like a drink or some food. 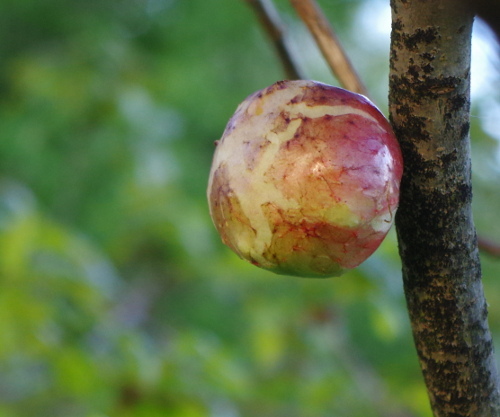 I found these decorative little apples on a walk last weekend, then returned later with my camera. Rarely have I seen them so beautifully coloured – just like the apples they are named after. Oak apples and other galls have been used to make ink since at least Roman times, and it was the most commonly used ink from the 9th to the 20th century in Europe – it is still used for legal records in the UK such as birth, marriage and death certificates because it is both permanent and waterproof. Best used in a disposable quill pen rather than your best fountain pen! To make it, first you need some galls that have been vacated by the wasp and are dry. Crush them to powder, then add warm water and iron in some form, eg rusty nails or filings, and cover. Keep in a warm place to ferment for a few days. Then drain off the ink, filtering out the solids if necessary, and store it in an airtight container. It has a fairly short shelf-life; oxidation reveals the ink and turns it darker on the page, but isn’t so helpful before it has been formed into writing! The ink is also quite acidic, being formed from tannic acid and iron – although apparently crushed egg shells can be used to neutralise it and prevent it from degrading the paper. Medicinally oak apples can be used like oak bark to stop internal bleeding. However while chewing bark is fine, I cannot recommend chewing an oak apple – they are about the most astringent of all vegetable compounds. Instead, use a decoction. They are also known for curing dysentery. 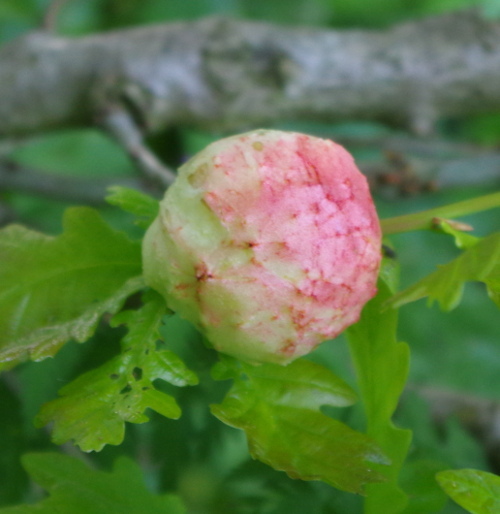 There is not a lot of folklore associated with the oak apple. However, it is said that if a “worm” (larva) is found inside the gall on Michaelmas Day (29th September) then the year will be pleasant and unexceptional, if a fly is found inside it will be a moderate season, but if a spider is found, then it will be a bad year with food shortages and ruined crops. If nothing is found however, then serious diseases will occur all that year. 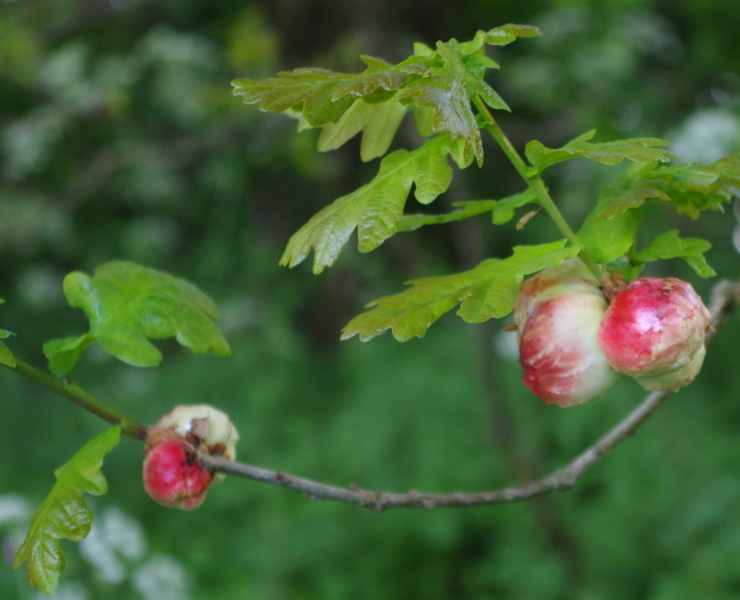 The oak apples used to have a much greater significance in England, being used as decorations on Oak Apple Day, 29th May. The mid 1600s saw civil war in England, followed by a very Puritan Commonwealth rule. All sorts of traditional festivities and activities were banned, such as Maypole dancing, Christmas decorations or feasting, carol singing, theatres, inns, football or other sports, walking on a Sunday except to or from church, and even wearing colourful clothes or makeup etc. Even the various Medieval Saints’ Feast days were stopped, and instead Fast days were introduced once a month. It was on his birthday, 29th May, in 1660 that Charles II rode triumphantly into London to return as King. The day was declared a holiday and was entirely given over to dancing, feasting and merry-making – and the event was repeated every year. The story of how he hid in an oak tree to escape parliamentarian forces became widespread and led to the Oak tree becoming the symbol both for this day and of England. To show their loyalty and support for the monarchy and its restoration, doorways were decorated with oak boughs and people wore sprigs of oak in their clothing or on their hats – of which oak apples are the most decorative part at the end of May. They were liable to be punished with pinching or nettles if they failed to do so! While this holiday has become much less known since the Victorians removed it from the official calendar (a day given over to merry-making didn’t fit well in that period!) it is still celebrated in various villages and towns around the country – including Castleton in Derbyshire where they hold a garland parade every year on this day. Here is the (almost!) final result of a project that has been several years in the making. 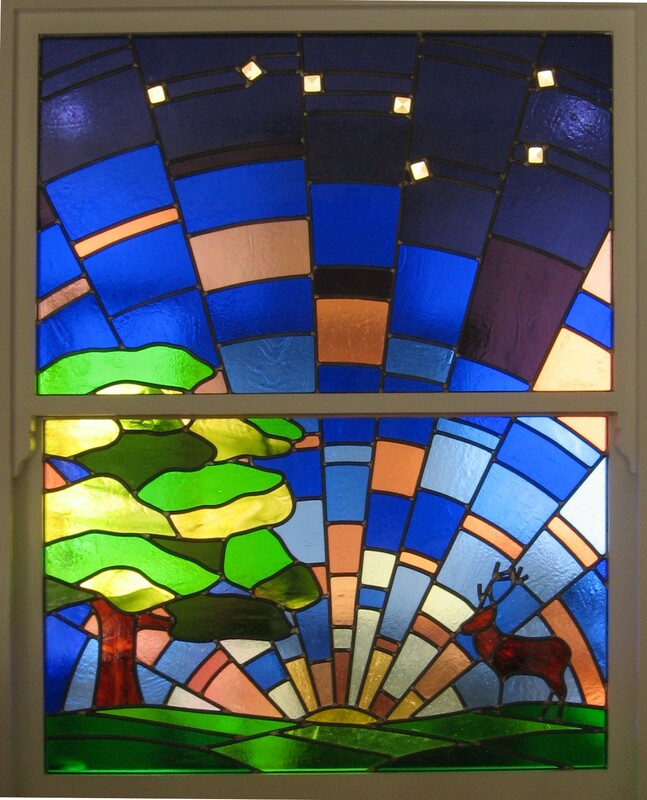 It is in fact the last stained glass project I completed when pregnant with M… but for various reasons has taken until now to actually be fitted into place. 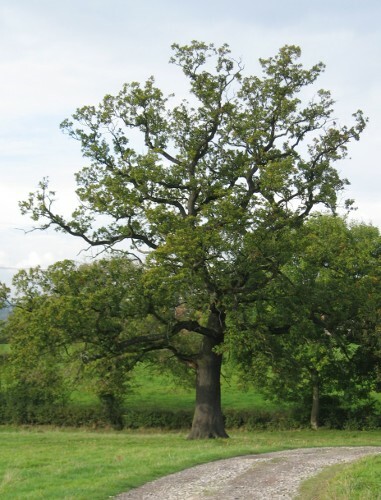 Oak tree – for protection and strength, for thanks, for journeying from. Stag – represents partnership, balance, majesty, confidence, vitality. A friend in this world and in other worlds. Grounding. Trust. Sunrise – beginnings, hope. There is always light on the horizon. Stars – great bear (family animal), ploughing a furrow, pointing the way, some say the source of the seven rays. Also a saucepan with a bent handle… well it is the kitchen on one side! It was tempting to use a version of this design for a Winter Solstice card, but of course here the oak tree is in the full leaf colours of midsummer. From a point of view of living with it as a picture, it feels relevant for at least two seasons each year, compared to flowers which only have one season. For the technically minded, the glass used is mostly Kokomo, some Spectrum and some Dynasty. The stars are bevels. The antlers were done by cutting the heart out of the lead came where it overlaps the glass; they were soldered in place and cemented as if they were attached as normal. 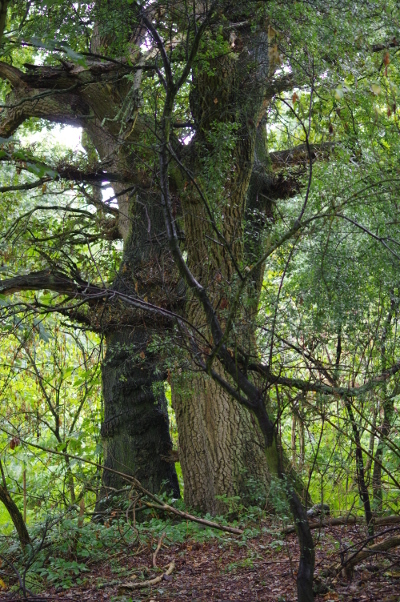 Cathedral Oak, also known as Millennial Oak, in Savernake Forest, Wiltshire. Girth almost 10m at 1m above ground. Last week I was on holiday in Wiltshire, enjoying some Spring sunshine and frosty nights, and revisiting some very old trees and even older stones. To be in the presence of living beings that are ancient is, for me, to experience a sense of timelessness and peace. To know that I am part of something almost greater than I can conceive, and that I am transient in physical form, with a far shorter life expectancy than this tree. And yet I am also part of everything, connected to the tree and the rocks, and therefore timeless. I was reminded particularly of how our ancestors thought a solstice sunrise or sunset was sufficient excuse to build a huge monument out of stone in order to enhance their celebrations. 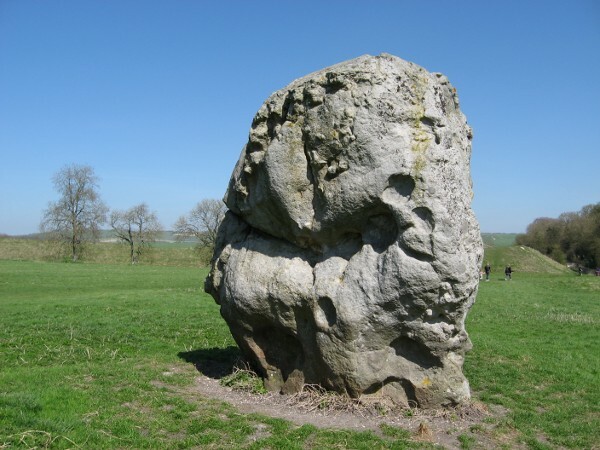 At Avebury, as at Stonehenge, there is an avenue leading up to the stone circles and I could feel a sense of excitement as I rounded the summit to see my destination. How, I wondered, did we manage to complicate our life so far that we stopped celebrating the stations of the sun? Why do we look for more in everything, instead of realising fully what already Is? And how can I get back to this in my own life? Musar feels that the fault lines and mountains talk to him and answer his questions about their origins. He perceives the history of a mountain, its internal stresses, its erosion patterns, and the forces that have shaped it and that will wear it down. Musar can dip his finger into a subterranean stream and instantly identify the minerals present, their concentration, and the sources of the stream. He senses forests and the evolution of trees and plants and how they affect the earth. … He can sit watching the stars moving through the sky from dust to dawn and feel that no more than a moment of time has gone. He can gaze into past ages and epochs of time and not feel in the least old or weary. For Musar, everything that has shape, form, and weight is fascinating and full of wonder. Unlike a mountain or a plateau, Musar never grows old. He is constantly full of enthusiasm. For Musar, there is no need to hurry; there is no need to worry – each moment is satisfying, and each moment is a treasure of the heart. The silence in which he dwells is a magic well from which he sips and drinks the beauty of the earth. I have read of Machaelle Small Wright’s experiences at the solstices and equinoxes, where there is magic in the exact moment of the sun’s transition. I set my alarm for 5:10 and prepared for the equinox. At the moment of the equinox, I felt a strong wave of energy wash through me, and I saw the garden at Perelandra take a shift. The Summer solstice: 1:02 A.M.
… At 1.02 I felt the Annex fill with energy and saw it light up. I received an invitation to come join nature in the new Annex, to join their party. When I entered the Annex, I could feel the celebration all around. Then a nature spirit – a faun – stood before me and allowed himself to become visible to my naked eye. I hardly knew what to say, except “Hello” and “I love you.” I made clear eye contact with this lovely faun for the longest time. It was a special and extraordinary moment, I remained in the Annex for about an hour, feeling the movement and celebration going on around and within me. So I spent some time simply communing with the stones at Avebury, and seeing the delight in each one. All unique, individual, characterful, with their own story to tell. Yes they were once part of something much greater as many stones are now missing, our ancestors having knocked over and even destroyed many stones through fear, but the original layout can still be sensed through the landscape. One day we may collectively regain the understanding and connections that humans had with the Earth, at which point it, or similar structures may be reborn in a new form. For now, it represents where we are – which is probably better than where we were even a few decades ago. For me personally I feel a parallel in that I started as a child with every possibility open to me, free of doubts, then science and logic and often fear took over. Finally I started to find my way again, connecting to my intuitive nature and the Spirit within. I feel I am still incomplete, for there is so much I don’t know yet feel I should be able to understand on some level, but I am now starting to find the building blocks of reconnecting. Much like the stone circle at Avebury, where some stones have been restored to their original positions. I have mentioned before that there is a particular hollow oak tree near here that I use as a doorway for the start of journeys. There are several oaks in my area of a similar age, maybe 150-200 years, that would have been planted along the hawthorn hedgerows in order to give shelter to animals in the fields. This particular tree has lost its hedge and it stands alone but for the cows and the many walkers with dogs who pass it each day. I first stood inside the tree several years ago. You have to duck down and step up to get in, and then stand carefully as it is only just large enough and my head is likely to find wood or cobwebs. There is frequently a pool of water lying just in front of the entrance. 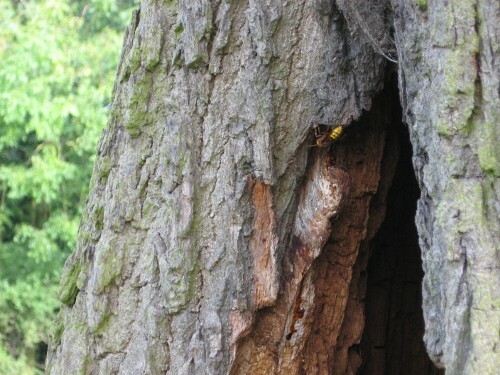 There is a second entrance to the trunk on the opposite side (just visible in the photo), but only for rabbits and other small creatures. It all feels quite special, and is surprisingly welcoming even though this is by no means an ‘Ancient’ tree. However this last summer has seen some changes. Rubbish and part-filled beer cans have appeared on various occasions around and even inside the tree, and it became apparent that some people were using it in less than harmonious ways. I found this quite upsetting. 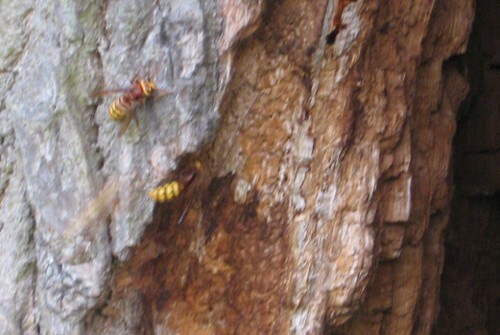 Then on my next visit I was alarmed to see two or three enormous wasps flying out of the tree. Hornets?! What were they doing here? I’ve never seen hornets in my life, just read about them in books, and certainly didn’t know they lived in Northern England. So here are the best photos I was able to take this afternoon – it proved trickier than anticipated as although there were about a dozen insects flying about, they didn’t stay still! Having a tripod (and possibly a better camera on top of it!) instead of a toddler with me might have resulted in better quality pictures, but hopefully this gives an idea of them. I asked what the spirit meaning was behind hornets and had the answer “protection, but always look at what the hornets are protecting and why.” Also “Always likely to be powerful.” This is quite different from any meanings for wasps that I have found online, where anger, being a warrior, overcoming challenges, expecting the unexpected, and homebuilding or other new beginnings can be themes. I have since wondered whether ‘protection’ was in fact a more literal meaning than is often ascribed to animals encountered in dreams or other worlds; it may be that hornets may also signify the same meanings as other wasps under different circumstances. From what I have found out from nature websites however, they mainly eat insects and are generally less aggressive. I was also struck by how if we become tired and run down we leave ourselves open to unwanted invaders or dis-ease, and usually see it as a negative, unwanted presence. The oak tree, displaying an individualised consciousness that I didn’t know was possible, is aware that it is decaying and instead of allowing mistreatment, has decided which invader to invite within. And it has chosen a barely native species that is sure to be noticed by all and seems to be already doing the job asked of it. Nature in harmony. I have been assured that the tree will be here for as long as I am, but not much longer. It will be interesting to see if that is indeed the case! I have for some years thought of myself as an animist, that is one who sees everything as being conscious and connected to Spirit. You, me, animals, plants, rocks, weather, all is conscious and all responds to us if we take the time to notice or to communicate. However it is one thing to agree with an idea, another to really connect with everything around me on equal terms. The first ‘object’ I remember having a strong relationship with, after the usual childhood dolls and soft toys, was my bicycle. I rode a Claude Butler Mistral for nearly ten years, covering many thousands of miles to school or college, many of which were on my own. I used to talk to it, treat it as as partner on the eight mile journey home each day. After a while it started answering me back. Ringing its bell when there was someone behind me, getting fewer punctures or mechanical failures as it got older and I encouraged it more and more. I was quite sad when it had to be retired after a pothole incident in which I took flying lessons. I am still building a relationship with my Orbit Gold Medal that replaced it, though again find that the more it is encouraged and talked to the more the tyres stay hard, the chain rides without jumping, and the bike gets me to where I want to be without difficulty. Houses are said to stay up better if they are lived in. The usual assumption is, I believe, that having someone there all the time means that problems can be spotted and sorted out while they are small. However I now think it is because a loved house will look after its occupants and not disintegrate as readily as one that is neglected and sad. I have been trying to connect to our house quite a bit recently, as we try to complete our slightly stalled building projects, and am finding it very rewarding. The colours I want to add seem to become richer, more vibrant. The place feels happier. Things happen. Communicating with plants came relatively late to me, long after bicycles anyway, mainly because it never occurred to me it was possible. The more I understand the particular nature of a species, and love it for all of its qualities, the easier it seems to be to attune to it. Oak I connected to the first time I tried, along with several others that I have played around since childhood; Yew took me a long time and took me on quite a journey to really understand it and the great age to which it can live (thousands of years, not hundreds as was commonly believed). I still find it easier to connect to mature trees than younger ones, sometimes it feels like talking to children or teenagers when in a newly planted woodland! But I have found that once a connection is made with a particular tree or species it is much easier to reconnect on future occasions. It is like greeting a friend. I have learned a lot about weather in recent years, and have had proof on several occasions now that it is conscious. One day I may write more, but the time doesn’t feel right yet; however there are many traditions around the world where the shaman’s job was to work with the weather in order to help keep the balance in the local area. I am now trying to do this in my small corner of Derbyshire. However, watching M I now realise how little I really know about connecting to all things. She has learned that we wave to people when we say goodbye, and copies this. However she doesn’t often wave to people, it is more likely to be to the dogs we pass. Or rubbish that I don’t want her to touch. A playground we have been at, or bench we have sat on. More recently a single leaf or a feather she has picked up and looked at gets waved goodbye to before we can continue our walk. Even the sunrise she has been watching will get a wave before she turns around. In short, anything she has made a connection with is honoured as a friend. It may well be that she ceases to do this as she grows up and becomes more involved with the earthly plain, but they will always be there for her when she is ready. What a wonderful way to live life. As mentioned previously in ‘Dreams’, I have started a project to write stories about trees. If anyone ever thinks that a journey is entirely a figment of their imagination, then I can honestly reply that I could never have made this up! I initially assumed that the twenty trees would be those of the tree ogham referred to, which I had studied a little and for which I had collected a stick from around fourteen of the standard twenty – slow work when I refused to be responsible for the deliberate cutting of any tree. (A story for another day!) But that didn’t feel right. I tried writing down twenty favourite trees, but that didn’t feel right either. So I did what I often do when I don’t know how to decide something: wrote a list of every tree I could think of, and then dowsed through it for which ones wanted to be included. Amazingly from a list of over a hundred I ended up with exactly twenty. Some I know well, one or two I don’t yet. Some have an obvious story, some I haven’t a clue but I trust they will let me know at the right time. Most are native, a few are not, although all can grow here. It is a slightly quirky list, but at the same time shows balance. I have done my best to accept every tree on the list and not change the list in any way – I would publish it, but then realised I might start receiving suggestions for stories not yet written. You’ll just have to trust me. The stories are intended to be for any age, but each one will be different and will take its inspiration directly from the tree in question. More than that I cannot predict! As I write this, two are complete, two are started, and one is but a draft idea. Five years feels like a tough challenge to create ‘modern legends’ as in my experience stories tend to evolve and develop and become multi-layered over time. Some may start out as short stories inspired by a particular tree. Some trees may end up with more than one story. 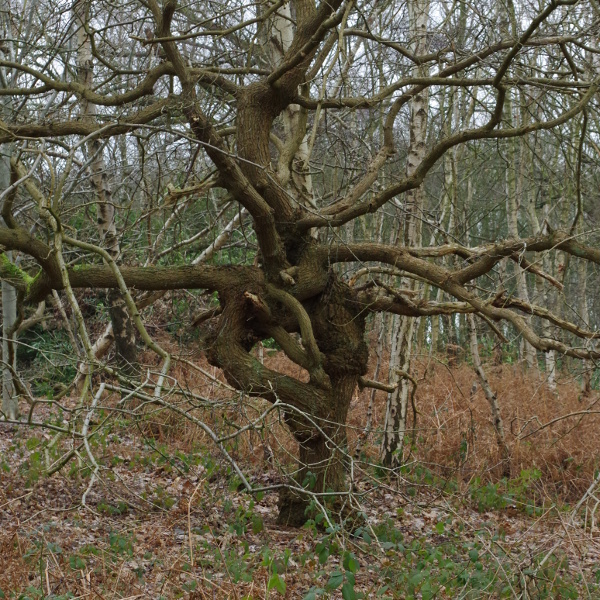 The first story, Sweet Chestnut, is the only one I wrote before starting this blog. It came to me last year as I was trying to entertain baby M in her pushchair, and I told it to her in several different versions as she fell asleep, before I finally wrote it down earlier this year. But the actual starting point was someone else having trouble believing in themself, trying to change to please others and ending up pleasing no one. 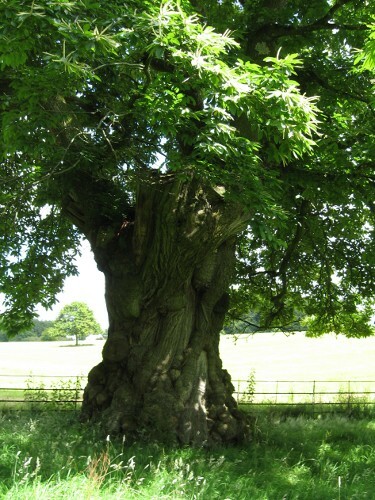 I asked which tree could help, and was given the answer: Sweet Chestnut. Sweet Chestnut is a tree that was introduced in Britain by the Romans for its nuts, which make a good flour substitute. For that reason it was sometimes called the Bread Tree. The nuts used to be very popular roasted on city streets, although I haven’t seen them sold like this for many years now. However, the largest nuts tend to be imported, as they grow better in warmer climates. 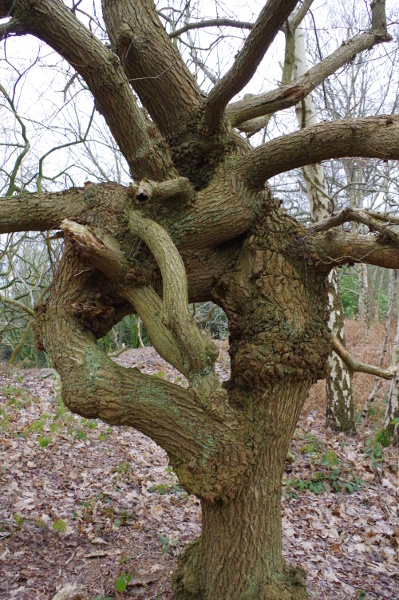 The timber is also known as Poor Man’s Oak, as it looks similar and grows faster, but it is not as strong for it tends to split when it dries unless young or coppiced branches are used. However it has a very high level of tannins, so lasts longer out of doors than most other timber. For this reason it is often used for post and rail fences or gates, or in Italy for barrels for balsamic vinegar. There are self-fertile varieties available now, but I was struck by the way that grand houses often have a quartet of wonderful twisted trees on their side lawns: Mottisfont Abbey is a good example. There are also wonderful forests of Sweet Chestnuts growing up the mountainsides of Herault’s Montagne Noire. We spent a Winter’s holiday in the area in 2011, enjoying the twisted grey branches above us while we scrunched through dried leaves on the old stone paths. Sadly their heyday had passed and the nuts were no longer being harvested, but the trees are still there growing in the stone terraces high above the villages. Last weekend was the Summer Solstice, when the Earth reaches its maximum tilt of the North pole towards the sun and we get our longest day. Some people have said to me ‘I didn’t really do anything for Litha…’ as if they should be doing something special. The well-known ceremonies at Stonehenge and other places may foster the feeling that we should all be partying every time a Sabbat comes along, but it is only one way. Midsummer is not a time of the year that has many traditions around it, like Mayday does stretching back centuries, or even Yule, although there are some good creation myths that have been written and a few old stories adapted. But from a nature perspective it is a very important time of the year – because day length is as important as temperature to the plants around us. In the garden the solstice marks the transition between planting vegetables to crop in summer, which should be in the ground and growing strongly by now, and those to sow or transplant late to avoid them bolting before the autumn. Jobs are marked as being either before or after the solstice. Trees, too, will open all their leaves on the old shoots by now and get all their blossom pollinated to set fruit. After the longest day they will reject what fruit they cannot sustain, and set about growing. New shoots, new leaves, and swelling the fruits that remain. We, too, can use this energy for positive action in our lives. Two years ago at the Summer Solstice I had the shock of seeing a 50 year old oak tree on my road cut down and turned into woodchips, for no apparent reason except that someone didn’t want it there any more. The nature of my walk changed that day. I gathered up as many naturally fallen oak leaves as I could find along my route (a challenge at this time of year) and took them back home to make a ‘green man’ image, glueing them to a wooden Camembert lid. I then created a ritual and meditation based around the Oak, completely rewriting the planned ritual I had. It felt exactly right. This year, by contrast, I did not do a ritual, but had a premonition that I would be awake for the sunrise. Sure enough, M woke me and I enjoyed the pinks and oranges reflected into the room in the small hours of the morning – probably the first Summer solstice sunrise I have seen, certainly the first I have seen consciously, welcoming the sun as it reaches its zenith. Later we had a walk in the sunshine and then ate lots of summer fruits from the garden. It was enough. 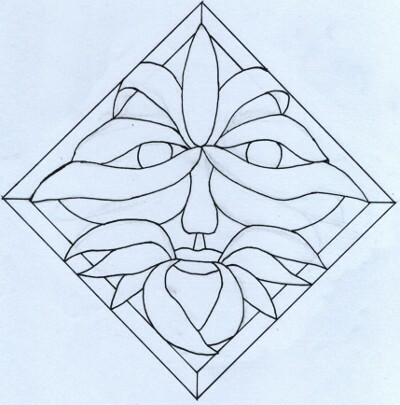 The Green Man is at his peak, and I am reminded of an experimental stained glass design I did at this time a few years ago, pictured above. I might even make it one day. Meanwhile, enjoy his energy. For eleven summers now, I have surveyed a tiny area of Derbyshire for Plantlife‘s Common Plants Survey. My randomly allocated square is not somewhere I would normally choose to walk, being the wrong side of a dual carriageway from here, but it has proved very interesting to return to the same small area over such a period of time, and chart the changes. I now think of it as ‘my’ square, so while I could swap to somewhere closer, as this year the survey undergoes massive changes, I decided to stay put. In its favour are well-kept footpaths which go through the exact centre of the square, and a small patch of woodland filled with bluebells in late spring. The survey has changed twice since I started: originally there was a list of 65 plants, and I would check for their abundance within three specific areas – a square plot in the exact centre of the square, a linear plot nearby, and I chose to survey an additional linear plot that was along a particularly interesting bit of hedgerow. The list was then extended to 99 plants, and instead of the ‘habitat plot’, a footpath was followed North-South through the whole square to simply see what was present. I had the option of being a ‘super surveyor’ and listing all the plants, but 99 seemed to be a good number to get to know. Given that for several of these years I had health issues, or was pregnant, or had a baby in a sling, simple was good! This year the survey is changing again, as a transition to relaunching next year to create something far more in depth, giving hopefully robust data that can be used to monitor how our wildflowers are changing over time. 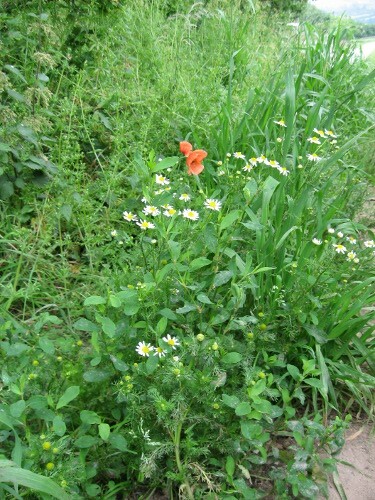 The list has been expanded to 400 plants, and includes common native species, those that are specific or indicative to particular types of habitat, and some invasive species. Habitats plots are back, centre plots are out (I suspect many were difficult to access), and the path idea remains. 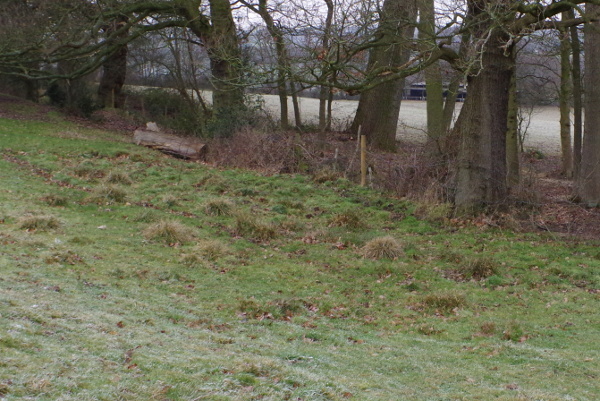 One plot I am surveying this year remains in almost exactly the same location as the previous ten years – my original centre linear plot, which runs between the footpath and a stone wall. It is now 25m long not 20m which makes sense, and I have moved it up 2m to avoid a patch by the gate that has been mown since the nearby derelict farm buildings were converted into houses, but these seem like minor tweaks. The field the other side of the footpath was originally surveyed (or rather, a 5x5m patch in the corner was) and I have seen it change from clover in the first few years to arable crops, this year barley. However apart from occasional pruning of the overhanging oak trees, the linear plot gets very little attention and as a result it has become a riot of colour in early summer. Besides grasses, the main plants are stickyweed, cow parley and hogweed with occasional nettles and brambles, but to fill in the gaps there are poppies, chamomiles, speedwell, plantains, vetches, and this year for the first time I spotted Geranium dissectum. Moving onto the path, this being a transition year there is an increased list of plants to spot but no booklet yet to confirm the identities, nor a simple list to tick off what I could see. So I took a different approach and wrote down every plant I could identify. Given that M’s concentration span wouldn’t allow me to look up plants in situ, I then took photographs of anything I wasn’t sure about and spent the next few days going through them and identifying as many of the remainder as I could. Some of course are not on the list for monitoring, and some will need the second visit for additional identification information, (either because there are similar plants that I didn’t get enough details to distinguish between them, or because they weren’t in flower yet) but how much more I learned by doing it this way! I have added at least half a dozen plants to my knowledge which I now feel I could recognise again, plus I am just starting to explore a whole new world of grasses – quite important on my path since around half of it is through fields that are only occasionally grazed by cows. The middle section of my path runs through the woodland – which has just been taken over by a new owner who has removed alien invaders like Himalayan Balsam and planted many new trees. However, not all of them have plant labels, and from those that do there are some very interesting and unexpected additions, including 37 different native species according to the notice on the entry style so my identification skills here will be developing as well! Unfortunately the intensive management renders the woodland fairly useless for monitoring purposes, but how fascinating to watch! And the remaining path? This runs along the side of an access track and has fairly different plants to the other sections, although by no means everything that I know is to be found within my square. However one new exciting find for this year was an pyramid orchid, just a solitary flower seen along this section and not yet open. I hope for some more by next year. So my list for the path is up to 63 flowering species, plus grasses, plus probably some sub-species of yellow flowers that I have lumped together (various sow thistles or hieraciums for example, not in the official list) giving me a starting point for future comparisons. I have spent some time this week creating a ‘gravatar’ for myself, the one you now see on my profile, based on a Sorrel leaf. Before creating my blog, in fact at intervals over the past few years, I have had reasons to consider what name I should use publicly. I could simply use my own name – but that might not be fair to others who share my surname but not my beliefs. I could have used my ‘spirit’ name, my ‘magickal’ name as some would term it, but it is too personal and too easily abused, given the power that lies in a name. I save it for conscious communications of the spirit kind. So I needed a new name, one to use for writing. And if it was to be a public name, it needed to say something about me, and to have the right kind of energies associated with it that I could use to help me with my writing. I explored several ideas, and was surprised how many potential names were already in use by other pagans. But then as so often happens on this path, everything just came together one day and felt right – the blog name and a writing name, and neither were in use by others as far as search engines could reveal. The simple meanings are given in my profile, the deeper meanings will become apparent over time as they gradually reveal themselves. Just to be sure, I checked the names using Chaldean Numerology, my preferred system. Sorrel = 22, the same as my own name, and the same as Dragon. Creator and Doer. Pen adds 18, or 9, the Spiritual number. 22 + 18 + 22 = 62 / 8. Theme of Balance. Under a rowan tree = 60 / 6. Theme of Love. As a group of numbers they expressed very well what I wished to create with my blog and I felt these energies should serve me well. So I had a name, but I didn’t yet have a symbol or image to use. Having considered and rejected various ideas, I read an interesting passage in ‘Summer with the Leprechauns’ by Tanis Helliwell, where she learns about various spiritual symbols or insignias. The leprechaun for example has a four leaf clover, symbolising control of the four elements – earth, air, fire and water. (What we sometimes interpret as luck, they see as manifesting what is wanted.) Her symbol is a rose, a seeker or keeper of spiritual truths; enlightenment. The elements each have their own symbols. What was my symbol I wondered, and could I use it for my blog? The easiest way for me to find out would be to journey. (I say easiest, but nothing is easy when you have a small child as a constant companion. The journey was done with a drumming CD and M sleeping half on top of me. No wonder most traditional shamans are male or over fifty!) As is my usual way, I started at a familiar hollow oak tree, about half a mile from here, found my cloak and staff where I had left them, and stated my question to the guardian of the doorway. Oak likes to challenge me with my question before I journey to otherworlds, knowing that I am wont to set off without having properly considered first, just because I have a rare opportunity to do so. Knowing my question, I thought I was well away today; I knew what I wanted to find out, and I hoped I would find a simple answer. But Oak stopped me in my tracks (not for the first time) by telling me to be sure I knew what it was I was asking, as I would have to look deep within myself for the answer. Also that when I add more names, I was adding more layers of secrecy, confusion, conflict, and potential. Make sure I do it consciously and by choice. He was not wrong! The experience of having my symbol shown to me was both revealing and unsettling, and I learned more about myself and who I was and where I was going than I could ever have anticipated. Like having a deep truth brought out into the open, one that just felt right and comfortable, but was formidable at the same time given the expectation contained within the truth. However when I asked if this was an appropriate symbol to use, the answer was no. Sorry folks – I won’t be sharing any details just yet! I asked what I should use, and was told I needed to look within myself for something appropriate for the blog. What kind of an answer was that? So the symbol I have chosen to use, as I said above, is a Sorrel leaf. The heart shape is very like an alder leaf, that of a watery nature with the drop bouncing back up, but tripled like a trefoil or a triskele which I generally interpret as being of three worlds. Very green, so it is aligned with the heart chakra in colour as well as shape. Celtic knotwork is not something I have done much of recently, but it felt appropriate here – one line, connecting all. Following it as I drew and coloured became a meditation of its own, much like walking a labyrinth, considering what it meant and what I hoped it would bring. The fact that it took three attempts to before I was satisfied only deepened my connections. And so my ‘gravatar’ brings alive the craft part of this blog at the same time. I knew I had got it right. And I also know that had I simply been told what to do it would not have been half as rewarding as working it out for myself.